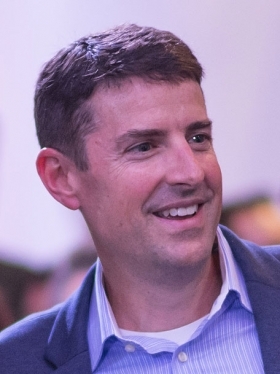 Jon McNeill, president of global sales and service at Tesla and an influential figure at the automaker, is jumping ship to join Lyft. Lyft Inc. hired Tesla Inc.'s Jon McNeill as COO to help the U.S. ride-hailing startup gain more ground on Uber Technologies Inc.
McNeill was president of global sales and service at Tesla and an influential figure at the automaker. On Tesla's earnings call with analysts and journalists on Wednesday, CEO Elon Musk said McNeill's department would report directly to him and that "there are no plans to search for a replacement." Tesla has pledged to create its own ride-hailing service using self-driving vehicles, though there have been scant signs of progress since Musk described the plan in 2016. However, he did revisit the topic on Wednesday's call. "We expect to operate kind of a shared autonomous fleet, like a combination of Uber or Lyft and Airbnb, where you can opt to have your car enter a shared fleet," he said. "That's a pretty significant opportunity." McNeill will fill a hole left by the departure late last year of Rex Tibbens, Lyft's former COO. Tibbens helped Lyft expand throughout the U.S. and steal market share from Uber. Lyft even surprised itself with its performance in 2017. As Uber crumbled and lost a CEO, America's second-place ride-hailing company said it increased market share by more than 50 percent and added a high-profile investor. Alphabet Inc.'s private equity arm, CapitalG, led a $1.5 billion investment, disclosed in October. General Motors is also a Lyft investor. In a statement Wednesday, Lyft said it more than doubled the number of rides on its system last year. But Lyft is a late entrant into self-driving vehicles and may tap McNeill to help. The San Francisco company is teaming up with Alphabet's Waymo and Aptiv while also trying to develop its own autonomous-driving technology. McNeill joined Tesla in November 2015 and serves on the board of Lululemon Athletica Inc. He was the only senior executive at Tesla with an annual cash bonus incentive plan. His compensation was tied to metrics including sales in the second half of last year. His total compensation fell to $2.34 million for 2017, a 64 percent drop from a year earlier. McNeill's responsibilities at the automaker included customer satisfaction, which has been an issue for Lyft and its competitors as they try to add riders and drivers while keeping costs manageable. McNeill, a founder of an insurance-related business called Censio, may be able to help Lyft navigate complexities with insuring drivers, which can be a major cost.